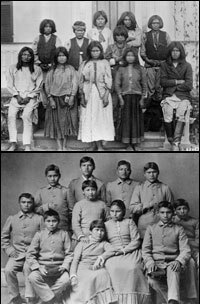 Top: A group of Chiricahua Apache students on their first day at Carlisle Indian School in Carlisle, Pa. Bottom: The same students four months later. Morning Edition, May 12, 2008 � For the government, it was a possible solution to the so-called Indian problem. For the tens of thousands of Indians who went to boarding schools, it's largely remembered as a time of abuse and desecration of culture. 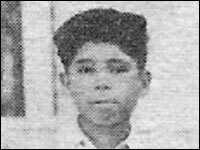 In 1945, Bill Wright, a Pattwin Indian, was sent to the Stewart Indian School in Nevada. He was just 6 years old. Wright remembers matrons bathing him in kerosene and shaving his head. Students at federal boarding schools were forbidden to express their culture � everything from wearing long hair to speaking even a single Indian word. 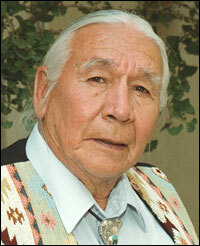 Wright said he lost not only his language, but also his American Indian name. Wright says he told her his name was Billy. " 'Your name's not Billy. Your name's 'TAH-rruhm,' " she told him. "And I went, 'That's not what they told me.' "
One school that remains is Sherman Indian High School in Riverside, Calif. � the same boarding school Toledo attended. This is part two of a two-part report. 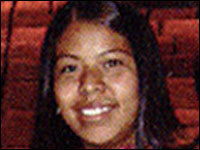 Sheila Patterson came to Sherman Indian High School from the San Carlos Apache Reservation in Arizona. Patterson misses her home, but she says she needed to get away from bad influences at her old high school. Students at Sherman learn traditional skills such as basket weaving. 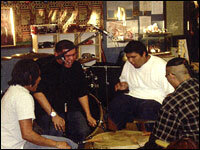 They are also taught American Indian languages and sing traditional songs. In addition to formal classes that teach American Indian customs and skills, there are also after-school activities for students, such as drum circles. Morning Edition, May 13, 2008 � These days, most American Indian children go to public schools. But remnants still exist of the boarding-school system the federal government set up for Indian children in the late 1800s. Some people, such as U.S. officials at the Bureau of Indian Affairs, question whether the government should continue to be in the boarding-school business. Many students at these schools say they are a necessary escape from the poverty and addiction that plague many reservations. At Sherman Indian High School in Riverside, Calif., dorm supervisors wake up students before the sun rises. Students have to clean their aging dorm buildings before class, and supervisor Teresa Iyotte says if they don't get up in time to clean the bathrooms, they'll suffer the consequences. "They get demerits if they're not up by 6," Iyotte says. Students get more demerits if they are not up by 6:15 a.m. and even more if they are not up by 6:30. A lot is expected of students at Sherman, one of seven federally funded off-reservation boarding schools for elementary or secondary education. Some of the most at-risk American Indian youth leave home to attend the schools, coming from more than 85 tribes from big cities and reservations across the country. Sheila Patterson came to Sherman from the San Carlos Apache Reservation in southeast Arizona. She says she is proud of her traditional ways, and she shows off the moccasins she wears with her ceremonial dress. Patterson misses the reservation but says she needed to leave. Back there, she says, a lot of people drink and also commit suicide. "That's why I had to get away and come here," she says. Most students come to Sherman because they see it as a way to do better. Some students, however, are ordered to attend by judges who see it as an alternative to jail. The national graduation rate for American Indians is about 50 percent. Charlotte Longenecker, a counselor at Sherman, says the low rate is not surprising. "When you work with a population that has the highest suicide rate, the highest alcoholism and drug usage rate � I've never met so many people in my life who had lost family members, and so many in such rapid succession � that's going to happen," Longenecker says. Administrators at Sherman say they maintain a tightly controlled environment. There is zero tolerance for drugs and alcohol. Students can leave campus only if they have earned a group activity, such as a trip to Wal-Mart. Steve Yankton, a student from the Pine Ridge Reservation in southwest South Dakota, says life at the boarding school can be tough. "We're always confined in a fence," Yankton said. "We really can't live high-school life like regular teenagers would. We can't just go shop at the mall whenever we want for how long we want. We can't go eat at a restaurant with our friends whenever we feel like we want. Staff always has to be around us." In Tara Charley-Baugus' classroom, students learn the language of the Dine � also known as Navajo � by taking tests and reciting vocabulary. They also sing traditional songs. "You learn something about your culture and history because of the sheep, from way back in the 1500s, when the Spaniards brought them in," she instructs students. "And you can teach these to your brothers and sisters. That's how you pass on the language." Until the 1960s, the government schools tried to expel Indian culture among students. They were severely punished if they practiced Indian ways. That isn't the case anymore. Teachers such as Baugus and Lorene Sisquoc are working to revive American Indian customs. At Sherman, Sisquoc teaches such traditional skills as basket weaving. But she says she is conflicted about why she is teaching these skills at a boarding school. "Why isn't it taught in our families, all our families?" she asks. The reason, she says, is the boarding schools themselves, because generations of students who didn't learn the old ways didn't pass them along to children of their own. "Kids were taken from their homes, and those traditional things weren't always taught," Sisquoc said. These days, off-reservation boarding schools have more applications than they can handle, according to Don Sims, Sherman's recently retired principal. But a recent federal budget change is cutting each school's funding by hundreds of thousands of dollars. Sims says this could put Sherman in dire straits. "We won't have enough money to start the school, to have enough staff to have the services needed for the kids," Sims said. "It's an impossible situation." Officials at the Bureau of Indian Affairs say they know these schools are in trouble. But they disagree over whether the federal government should even be running Indian schools in the 21st century. "You can talk to 20 people in our organization, and 10 people will say we shouldn't have off-reservation boarding schools, and 10 other people will say there's a need for these kinds of schools because of the at-risk students," said Angelita Felix of the BIA education office. In the past few decades, tribes have begun taking over boarding schools. They now control about half of them. Most are on the country's largest reservation, the Navajo Nation. 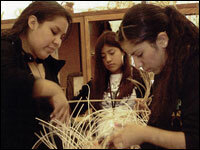 The Navajos discourage students from attending boarding schools off the reservation. Eddie Biakeddy, deputy director of the tribe's Department of Education, says educating kids on the reservation has become almost a matter of survival. "A lot of other Indian tribes in the United States have lost use of their language and therefore their culture," Biakeddy said. "And there is a goal of the Navajo Nation to establish its own educational system, where the Navajo Nation would have control over all the schools and there should be no need for any on-reservation students to go to an off-reservation boarding school." But many smaller tribes don't have the money or political organization to run their own schools, let alone facilities for at-risk youth. At Sherman, many students and recent alumni say the off-reservation boarding school system has helped them. "Sherman pretty much did save me, I guess, in a way," said Seana Edwards, a Prairie Band Potawatomi. She nearly failed freshman year at her public high school in New Hampshire and says she would have ended up working a dead-end job. But she transferred to Sherman, graduated and now attends the University of California, Berkeley. She goes back to Sherman often to convince students that they, too, can go to college. And she says she appreciates how far the school has come since the time when students wore uniforms and marched in lines. "You feel part of that history and you get sad, but at the same time, you realize that it's so much better today and you get the opportunity to change it. You get the opportunity to make it better. Not just for you but for other people, for younger generations." Edwards' own younger brother and sister are in elementary school in New Hampshire. But if they do need Sherman's tight structure, morning wake-ups and nightly check-ins someday, she wonders if Sherman Indian High School will still be there for them.